Q: I am trying to login to my account and i'm getting an error or the page just refreshes blank? A. If you know you are using the correct username and password, but still get an error, then you will need to clear the cookies from your internet browser, as they are interfering with the website. It's a QUICK and EASY fix! On your keyboard press and hold CNTRL SHIFT DEL, when a new box pops up, check all the boxes, change the date to later than 24 hours, then click the blue "Clear Data" button. Close your internet browser. Open a new internet browser page and login to the website. It will then accept your login. Q: I purchased $10 or more and I didn't receive my free alpha.. How do I get it? Q. I have a 4X4 .pes file that won't open on my machine, what is the problem? 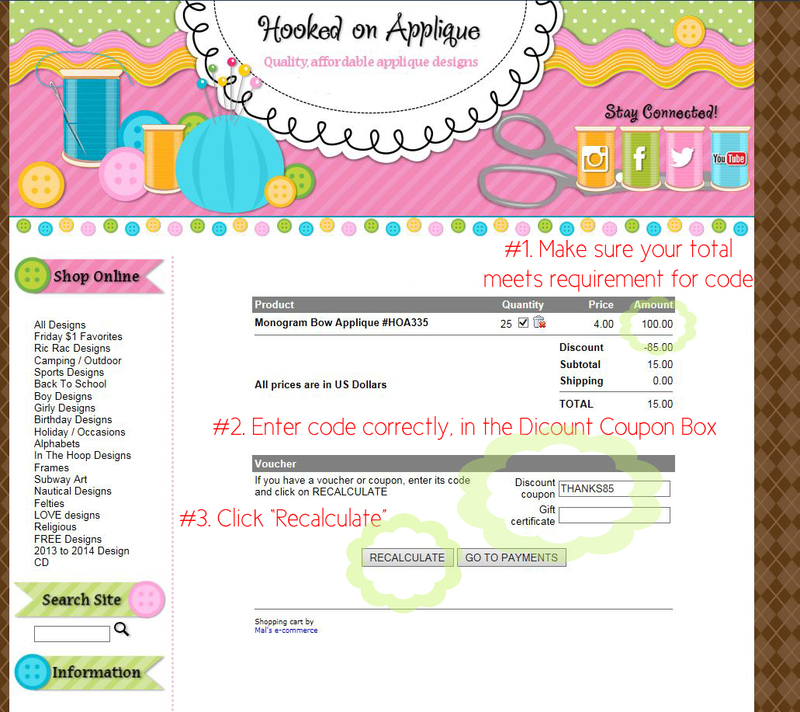 Q: How does the INSTANT DOWNLOAD feature work when I make a purchase from Hooked On Applique? *When you make a purchase, after your payment info is complete, you are re-directed to the Hooked On Applique website where your design file links will be posted for you. *An email containing your download links is also sent to the email address provided at checkout so you can download your designs at a later time. * You can also access your downloads in the "Customer Downloads Area"
Q. I am in the "Customer Download Area" section of the site, how do I know what my username/password are? A. At the moment I do not take custom orders or alterations of my designs. Q. Can your designs be re-sized? A. Yes, they can but I do not recommend re-sizing more or less than 10%. Q. Will you re-size a design for me? A. No, I do not take custom orders/alterations/resizing of designs at this time. Q. I can't get the discount code to work, what can I do?